Tranmere forward Adam McGurk has been handed a first Northern Ireland call-up for the friendly game against Malta in Valletta on 6 February. With Kyle Lafferty and David Healy left out, McGurk is included along with in-form Inverness striker Billy McKay. Larne-born McGurk, 24, played at youth level for Northern Ireland and won a Under-21 cap in 2009. 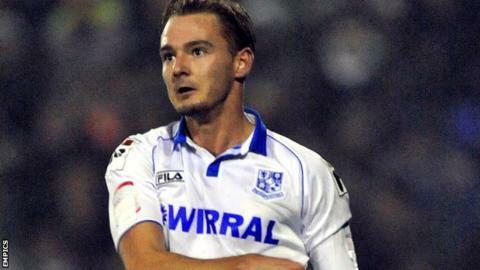 His four goals for League One Tranmere this season include a superb solo effort against Brentford last weekend. McGurk signed for Aston Villa as a 15-year-old in 2005 but his spell at the Villa Park outfit was badly hindered by a serious knee injury. After leaving Villa in early 2010, he had a brief stint at non-league club Hednesford Town before moving to Tranmere the following summer. Other notable inclusions are Hull City defender Alex Bruce and Liverpool's Ryan McLaughlin but there is no place in the squad for Peterborough's Grant McCann. Bruce has yet to make his Northern Ireland debut after switching allegiance from the Republic of Ireland last year. Manchester United's Jonny Evans has been included but there are doubts about his availability given his club's commitments over the coming weeks. Lafferty and Chris Baird will be suspended for Northern Ireland's next World Cup qualifier against Russia in March so their omission is not a major surprise. Northern Ireland's record goal-scorer Healy is also left out despite scoring the team's last-gasp equaliser in the World Cup qualifier draw against Azerbaijan in November. Manager Michael O'Neill revealed that he had held discussions with Healy, 33, earlier this week. "After the Azerbaijan game, he didn't play for three or four weeks at his club and that always caused a difficulty," said O'Neill. "He hasn't played a lot recently and I just felt it was better at this moment in time for him to focus on his fitness and his club situation and give himself a six or seven-week period to be in the best possible shape for the Russia and Israel games. "We have a number of young players in the squad all who are playing and scoring goals. It's important for them to show what they can do." With Lee Camp continuing to make himself unavailable to Michael O'Neill, the goalkeeping positions are filled by Roy Carroll, St Johnstone's Alan Mannus and Bury's Trevor Carson. Hughes (Fulham), J Evans (Manchester United), McGivern (Manchester City - at Hibernian on loan), Cathcart (Blackpool), McAuley (West Brom), Lafferty (Burnley), Bruce (Hull City).